If you want to publish your book through a traditional publishing house, you will need a query letter. Here are all the query letter tips you need to know. Whether you have written the next great literary masterpiece, or a reputation book to promote your business, one hard truth appears at the end of your last edit. You have to get it published. As we zoom through the 21st century, you have more publishing options than ever. You can publish the traditional way, through a publishing house. Think Penguin. Think McGraw-Hill. Think HarperCollins. You can publish through an online print-on-demand service. Think iUniverse. Think Xulon. Think Lulu. You can publish just for Kindle. You can publish just in PDF format on your own computer. You can self-publish by taking your manuscript to a local printer. You can also publish as an audio book. The toughest way to publish is the traditional way. What makes it so tough? You have to convince somebody that your book is worth investing in. You have to get past the gatekeeper. You might have to try dozens of gatekeepers until you find one that “gets it”. That one might not work for the likes of Penguin. They might work at a boutique publisher. You have to be realistic. You might not find any gatekeeper at any publishing house with your vision. Not even one who gets it. But there are ways to improve your odds. The most important way is with an effective query letter. So just how do you write a query letter for your novel or memoir? It is your first marketing piece. It is the most important thing you will ever write. It is proof of how concisely you can write. Yes, make it short and snappy. It is your foot in the door to getting published. If it doesn’t get you in, nothing will. One quick note. If you self-publish, the most important thing you will ever write is the blurb on the back of the book. That’s your elevator speech. Other than your book’s title and the cover graphics, that is what will move a person to buy your book or move on to the next book. However, if you publish traditionally, the quality of your query letter is the most important thing you will ever write. It will make the difference between being published after 15 rejection letters or after 150 rejection letters. In fact, parts of a really good query letter could find themselves in a literary agent’s pitch to publishers or even on the back cover of your book. This is where you most need to invest time and effort. So, ready for some query letter tips? Does this agent review your type of manuscript? That is the drop-dead bottom line. If the agent has not shown an interest in the type of manuscript you’ve written, go on to the next agent. What can you find out about this agent that links them to your story? Check their Facebook page and Twitter feed. Is their hometown mentioned in your manuscript? Have they represented several similar works recently? Play detective. What can you find out about this agent that links them to you? Do you share common hobbies? Do you love the same movies? Have you ever met the agent? Are you a fan of an author they represent (honestly)? 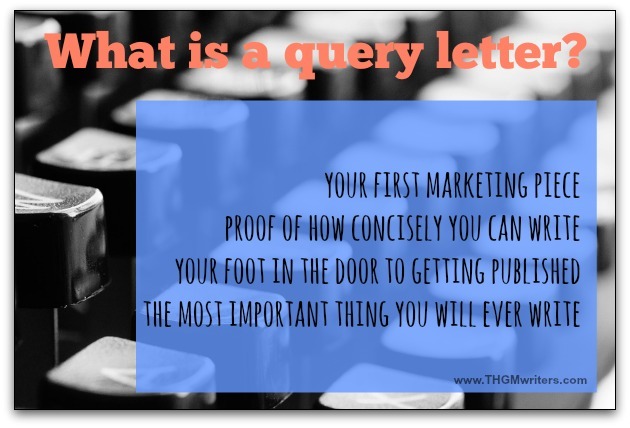 Your query letter is your first marketing piece. Know your target market. Your letter is not just about your book. It is about how the agent would benefit by representing your book. Decide which literary agents you want to pitch first. Don’t pull out 500 names all at once. This is like dating. You are looking for the right match. You might set up dates with a few cuties at once, but you don’t want to set up dates with 100 people. Your A list includes agents you really, really, really want to represent you. There should be no more than a handful on this list. These make you swoon. Your B list includes other agents that you think would be good to represent you. Your C list includes any other agent who handles your genre, who meets the drop-dead criteria in the first bullet point above. And don’t forget Google. Try searching for “literary agent” and your genre. For example: “literary agent self-help”. Or “literary agent dystopian future”. Before you start writing, pull out a sheet of paper. If you spent time staring at a blank sheet of paper while writing your masterpiece, it might have been because of writer’s block. Now, you are staring at it for a different reason. Now you are staring at the maximum space you have to sell your manuscript. Have you ever pondered the complexity of toothpaste? All the research. All the trials and errors. All the testing for taste and color and possibly even whether it actually cleans teeth? All that gets summarized on a billboard along the highway with five or six words. Now, it’s time to summarize your book. You have more than five of six words. Take one last look at that blank sheet of paper. It’s time to start writing. Now, let’s look at how to write a query letter to an agent, step by step. There is a formula to follow. Guess what you should do? Follow it. We start with how to address a query letter. Step 1. Your address goes on the upper right. Step 2. The agent’s address goes on the upper left. Step 3. Begin with a personal greeting, acknowledging the agent by name. Don’t botch the name! Do make it personal. Take another look at that blank sheet of paper. That’s right. It just got smaller. There is a formula for writing a query letter. Follow it! Step 4. If you found a link between the agent and yourself, or between the agent and your manuscript, make the connection. But be succinct. The agent is busy and the page is small. State very clearly why you chose this agent. “I’ve tried 17 other agents, so I thought I would also try you” is not a great way to query and agent. Get a real reason, and say it. Maybe you met the agent. Maybe you saw that they are interested in [GENRE and/or TOPIC]. Maybe the story is set in their hometown. This shows that you have done your homework and that you can write for your target market. If you can write a short letter for a single person, the agent might just believe that you can write a full manuscript for a cohort of people. That’s your first paragraph, and best to keep it to two lines or fewer. Step 5. Warning: you are about to consume most of that blank page of paper. Introduce your book. Can you explain the plot in a single, sizzling sentence? If you can’t, nobody else will bother. That single, sizzling sentence is “the hook”. It pulls the agent in, making them interested enough to read on. Introduce the protagonist. Say what they want and what or who stands in their way. Make the literary agent care about the story in just two or three paragraphs. If you can write a good cover blurb, that is an effective way to write this section. This section can also be tweaked to appeal to the agent. Pay close attention to the language they use when describing their interests (science fiction v.s. sci fi v.s. dystopian adventure v.s. dystopian fiction). Mirror their language in your letter. Each letter you write is a sales pitch. Know your customer, and pitch to win. Everything in this section should be very specific. Put yourself in an agent’s shoes. They might have read 30-40 submissions on Monday. And another 30-40 submissions on Tuesday. Yet another 30-40 submissions on Wednesday. How will yours be noticed as one of 30-40 submissions they read on Thursday? After a while, query letters all start to look the same. Don’t use generalities that can apply to the other 150-200 letters the agent receives that week. That’s no way to query an agent. Be so specific in everything you include that your manuscript will be the memorable one. Yes, the memorable one. Once again, keep it short. Write in plain language, crisp and to the point. This is not the place to wax literary. Step 6. Explain who you are. Specifically, say what about you makes you a good author for this book. This section will look very different if are pitching fiction, rather than non-fiction. “I felt like writing it” would not be very persuasive, even for fiction. “Each of my past three novels of this genre has outsold the previous one” is a good approach. “I personally witnessed an example of the manuscript’s main event” is a good approach. Once again, just a sentence or two will do. Mention your most prominent award(s) and your platform (how many followers you have, how many page views your blog has, etc.). But don’t mention them if they won’t impress. Don’t mention Twitter if you have only 1,000 followers. If you have 20,000, that’s worth mentioning. You might need a few paragraphs to establish your authority over the subject matter. Still, be very concise and mention just the few most impressive items. You can attach a full biography for more detail. Step 7. Ideally, you can tell the agent that your manuscript has been edited by a professional editor or written by a professional ghostwriter. If it hasn’t at least been professionally edited, maybe you should take care of that first. And if you have already self-published, mention that with as little fanfare as possible (unless it sold well for a self-published book…then a little fanfare is warranted, as that will be a selling point to any publisher). Step 8. Wind up by thanking the agent for their consideration and expressing your eagerness to hear back from them. That’s it. That should fill up your page, hopefully with enough white space around it to keep from scaring off claustrophobic agents. Is the readability at grade 8 or lower? If not, you have work to do. Have you used hyperbole in your letter? Is so, remove it now. Literary agents have read it all before. Do you say anything that detracts from your reputation? If so, remove it now. Do you use nouns where verbs will do? Use “I received the Winston Literary Award”, not “I was the recipient of the Winston Literary Award”. Those three extra (and unnecessary) words tell an agent that you can’t write all that well. Use “This book is about”, not “The subject of this book is”. Have you kept to one page? What I mean is, have you kept to one page using a standard font face, font size, margins and spacing? Don’t get fancy with font. Don’t squish things to fit them in. If they don’t fit with standard formatting, edit your text. Make them fit! Did you mention how much you value the agent’s time? If so remove it. It’s a bold-faced lie. If you really value the agent’s time, you would not make them waste it reading a sentence about how much you value their time. Did you waste the agent’s time by saying that your family loves the manuscript or that you’ve copyrighted it? Or by telling them your age or mentioning a basic blog or that this is your first book? Or by sharing plans for a movie adaptation or recounting the number of drafts you went through? If so, rip those out. Chances are that you will be sending a very similar letter to each agent. After all, steps 5, 6 and 7 should be pretty similar for every agent. But all my advice should be disregarded if an agent asks for something different. The customer is always right, and you are marketing to the agent. Review very carefully all the information the individual agent wants. You might have more editing to do. Finally…proofread! Then, proofread again. Of all the things you write, this is where you can least afford a typo. Next, check how the agent wants to receive submissions. Some still prefer a paper copy. Other accept only electronic submissions. Respect the agent’s wishes if you want to get read. Prepare your attachments. In many cases, that means either the full manuscript or a synopsis, along with the first three chapters. Sometimes, the literary agent will specify how much to send, such as “first 20 pages”. Often, the agent won’t want to see anything but the query letter. In those cases, don’t force your manuscript on the agent; just send what they ask for. Your package might also include a biography, especially for non-fiction authors. It might also include images, if you are proposing a children’s book. Just be sure to find out what the agent wants before sending anything. If you are sending a paper copy, don’t forget the self-addressed stamped envelope (SASE) if you have any hope of collecting your hard-earned rejection letter. That brings us to the cold-hard truth: most query letters earn you just that, a rejection letter. All the best authors have them, and many display them with pride. Why? Because they are free? Because wallpaper is expensive? Because you have to be frugal when your manuscript keeps getting rejected? Not quite. Those rejection letters are their battle scars. They are banners of a writer’s mettle. Anybody can write a manuscript. Any good writer can write a good manuscript. But only a heroic writer has the stamina and drive to eventually burst past the phalanx of rejection letters and live to tell the story. 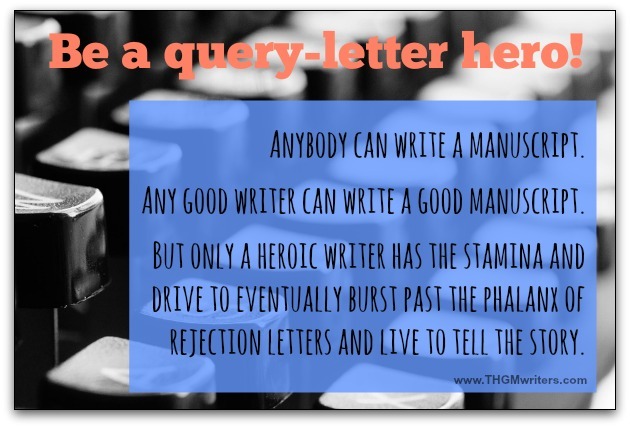 And it sure helps if you know how to write a good query letter. Even better if you know how to write a great query letter. So, should you send out 1,000 query of your great letters to grow your collection of rejection letters faster (or for a better chance of landing an agent)? First, the more you send, the lazier you will get doing your research on the agents. I know you are superior to most human beings, but even you cannot evade human nature forever. By your 14th letter, your resolve might weaken. Second, If you are meticulous in your research, why wait to research 100 agents? Why not send out the first few right away? Once you send your first set of letters, keep on researching. Prepare for your second wave. Most important, reaction to the first handful of queries often gives you valuable clues to improve your pitch (your letter, the synopsis, the query letter, etc.) We have edited synopsis’ and even whole manuscripts based on feedback from agents, making for stronger pitches. However, under no circumstances should you query more than one agent at a single agency. Until you receive a response from one agent, that agency is off-limits. If the agent likes the pitch but decides not to run with it, they will share it with their colleagues, anyway. And that’s how to write a query letter to a literary agent or a publisher or a magazine. So start planning your query letter. Make it short. Make it shine. Get published! This was a very nice read this morning.. While I’m not into publishing a book, these tips help me to figure out how to properly create a pitching message. How to propose my product idea. That’s very informative indeed! I think Step #6 is the most important one; Speak about yourself and Who you’re. In all honesty, I’ve experienced this myself a couple of times on pitching a service for a client. Unless you talk about yourself and your own experiences, client’s may not be very interested in your offering. This is how they get interested. Besides, I’ve found that detailed emails are getting better results. By writing up a detailed long cover letter, Client’s potentially prioritize you on other interested applicants. While most experts are advising for short emails, I’ve found a success myself with long detailed ones!! By the way, Thanks for the great read David.